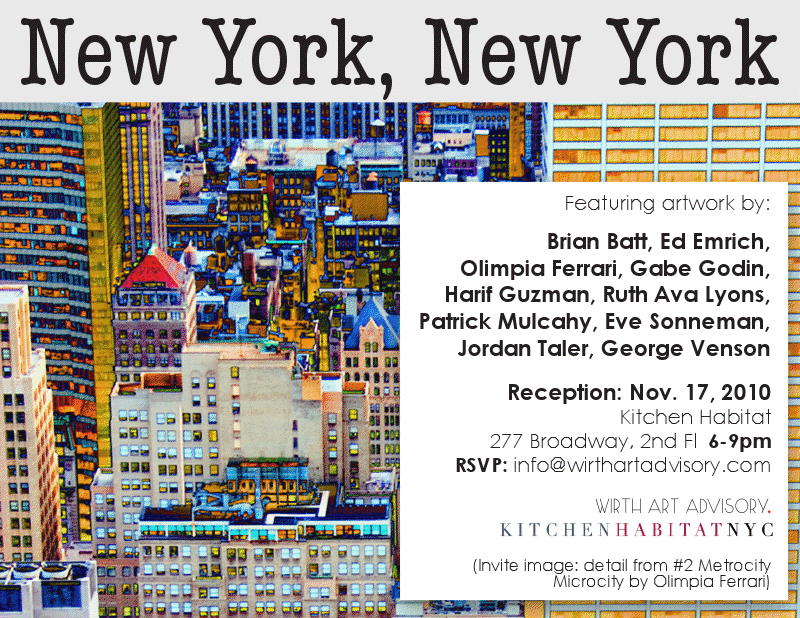 On November 17th, 2010, we opened our “New York, New York” gallery show at Kitchen Habitat NYC. It was a great success! “New York, New York” as the title indicates, took the city as a unifying theme. 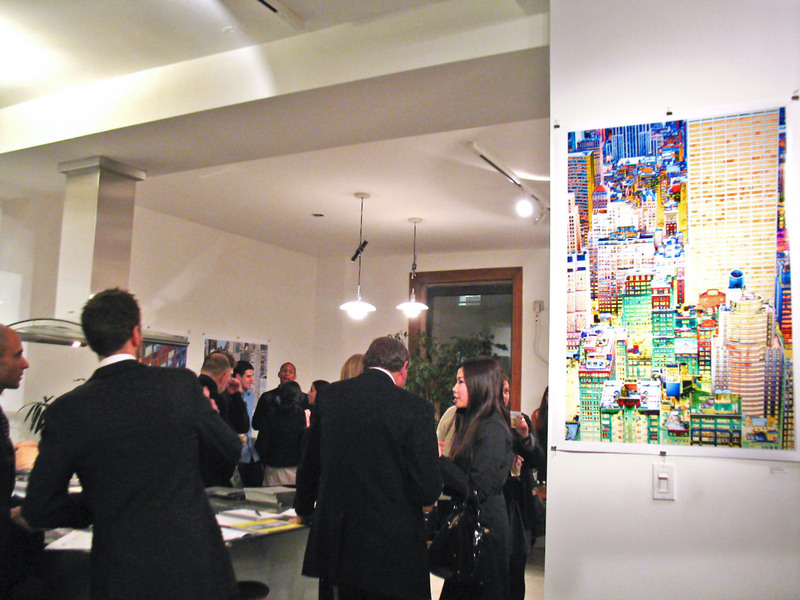 Curator Sabrina Wirth, native New Yorker and life-long resident, chose the very personal theme, saying she has always found the city “transformative and challenging.” As she put together the show she considered how the chosen venue and artwork would ultimately tell a uniquely New York story. 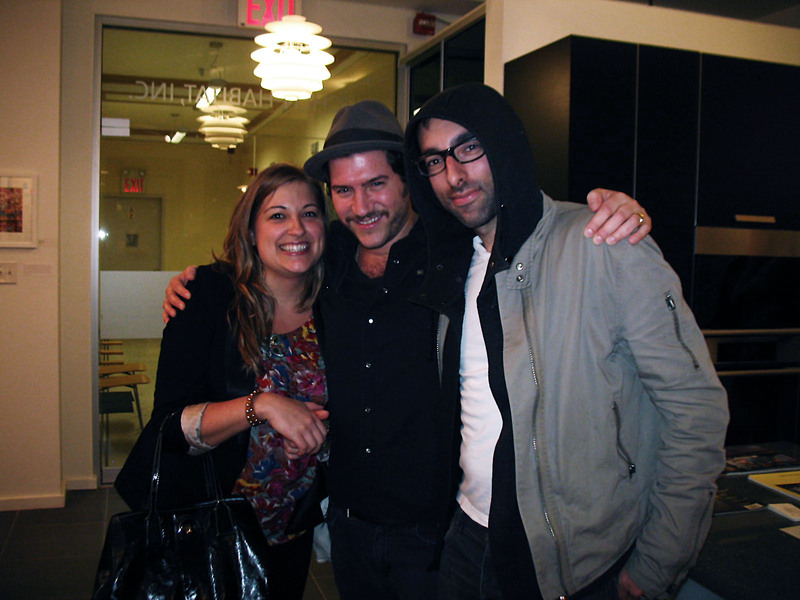 With ten artists from various backgrounds and in several media, New York served as the common thread. 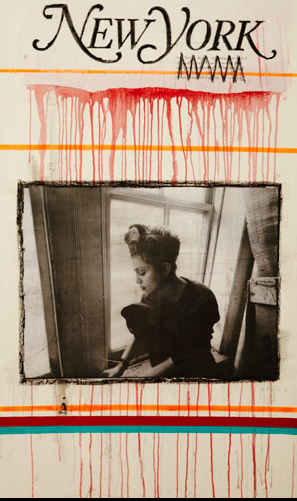 Acclaimed photographer Eve Sonneman makes her first gallery showing outside her normal representation at Nohra Haime Gallery with us, exhibiting two memorable photographs and a lovely watercolor. A permanent fixture on the New York art scene, Eve’s black and white photographs from the mid 1970s–“Fresh Fish, Chinatown” and “Coney Island Lovers”–speak both to her personal experience in the city as an artist and to all New Yorkers. Both iconic neighborhoods brim with personality, romance, and the undeniable ebb and flow of New York. To see more of Eve’s timeless work in several media, click here. 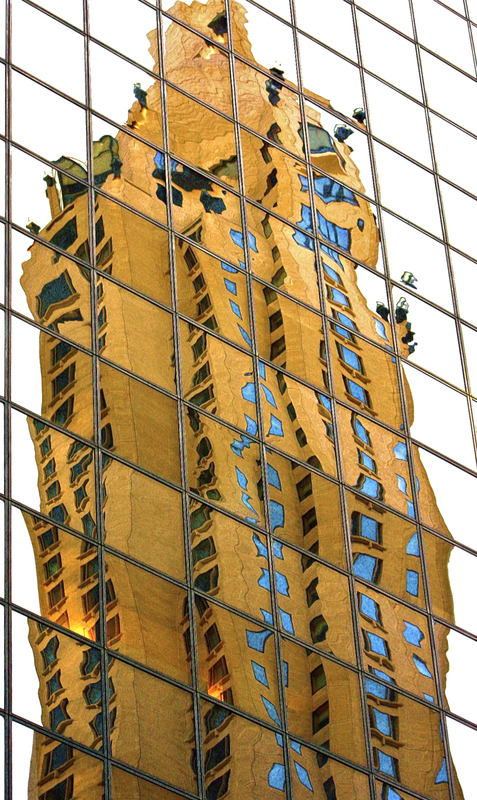 Ed Emrich, lawyer by day, features four large photographs, showing off with gusto his reflection-based photography technique, making us see a New York in which “nothing is ordinary and anything is possible.” Click for more of Ed’s photographs. Italian-born Olimpia Ferrari has three photographs from her “Metrochip Microcity” series, a sprawling feast for the eyes, exploring New York City’s architecture as it might infiltrate or connect to the mindspace of its inhabitants. 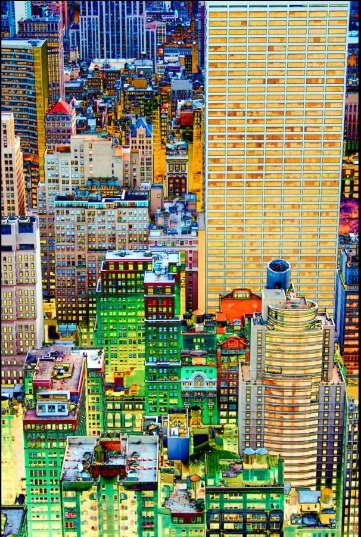 What’s remarkable about this series is that Olimpia does not manipulate the negative, metallic colors that permeate her NYC landscapes. She manages to produce that effect in the darkroom, without the help of photoshop. Wow! Gabe Godin features one mixed media piece, “Sunday Afternoon,” reminding us of the impersonality of New York’s consumer culture. Check out Gabe’s website. Downtown art regular and former professional skater Harif Guzman provided two paintings for the show, one big and one small. 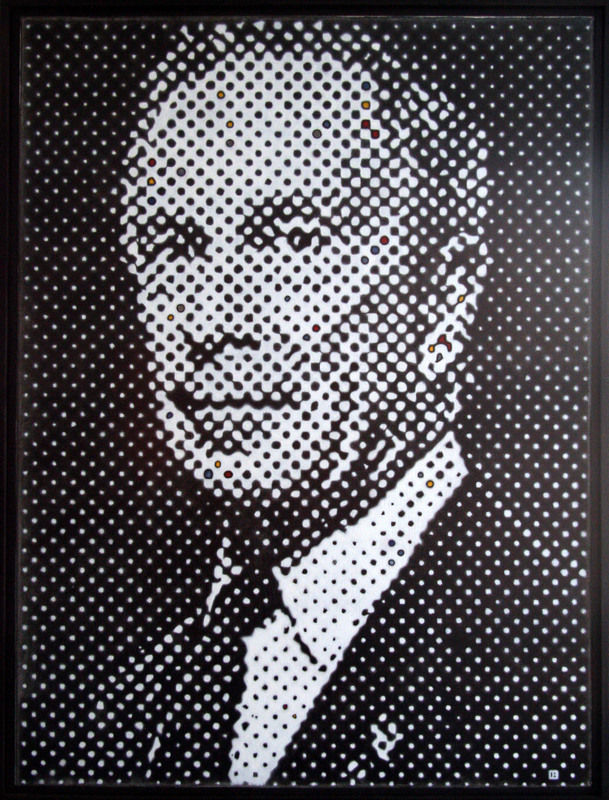 As he puts it, his work “rejects the glamorized bohemia that floods downtown Manhattan,” favoring instead gritty graffiti culture. Patrick Mulcahy showcases one powerful photograph, “Josh and David 2009” — reminding us of our everyday human relations rife with conflict, desire, and fear. 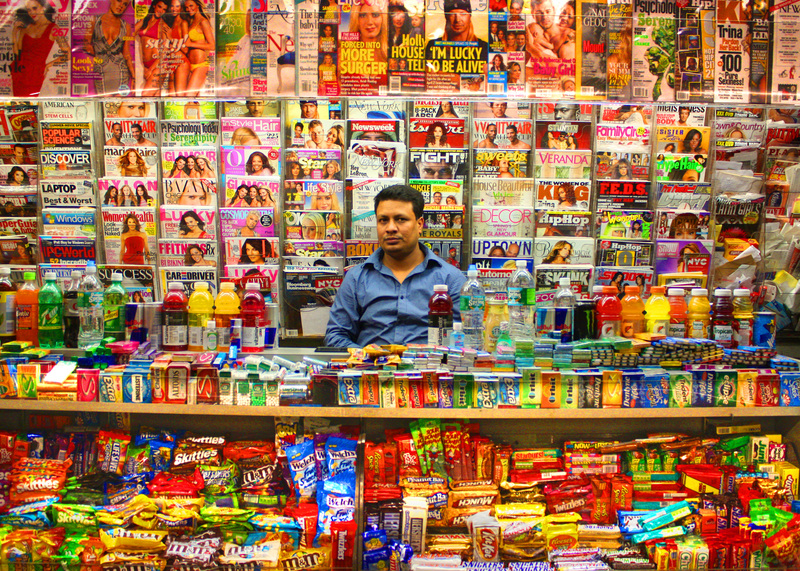 Talented newcomer Jordan Taler presents with one colorful photograph from his Newsstand series. Jordan calls a snapshot like this a “visual haiku”–a short and sweet matter-of-fact glimpse or statement about his surroundings. In the explosive and vibrant look at a city staple we are reminded that even ordinary magazines and packs of gum produce an eye-catching mosaic. Set against the impeccable kitchen showrooms at Kitchen Habitat NYC, one could not help but acknowledge how the work played into a domestic space, and specifically, a typical New York apartment space. Seeking refuge of the gallery space–or a home, a kitchen–we were still confronted with these New York pieces that drew us back into the city’s pace. New York, New York comes full circle then–reminding us that even in a New Yorker’s private space, the city never ceases to envelop us. That which we feel belongs to us really belongs to New York. But all of New York belongs to us. 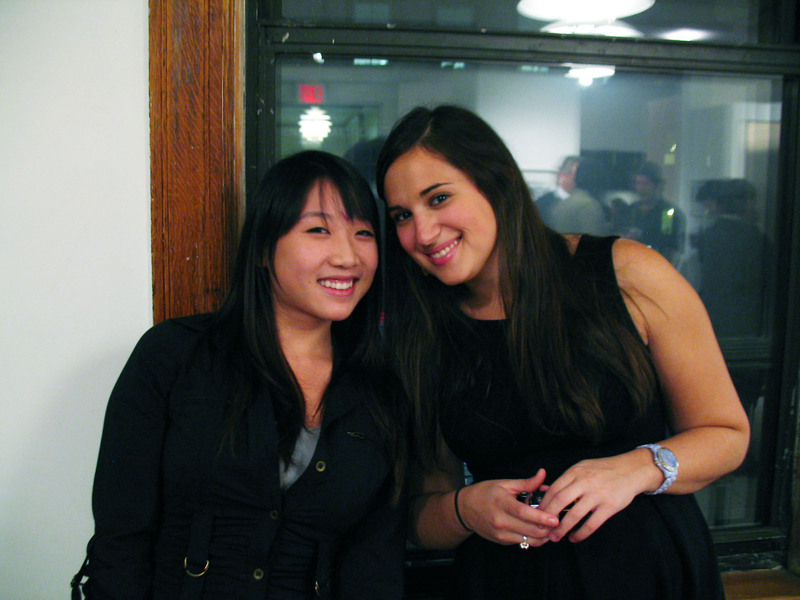 The works on view at will remain up until December 17th. If you weren’t able to stop by for the opening, make sure to see these gems in the next few weeks. 277 Broadway, at Chambers Street, Suite 201. 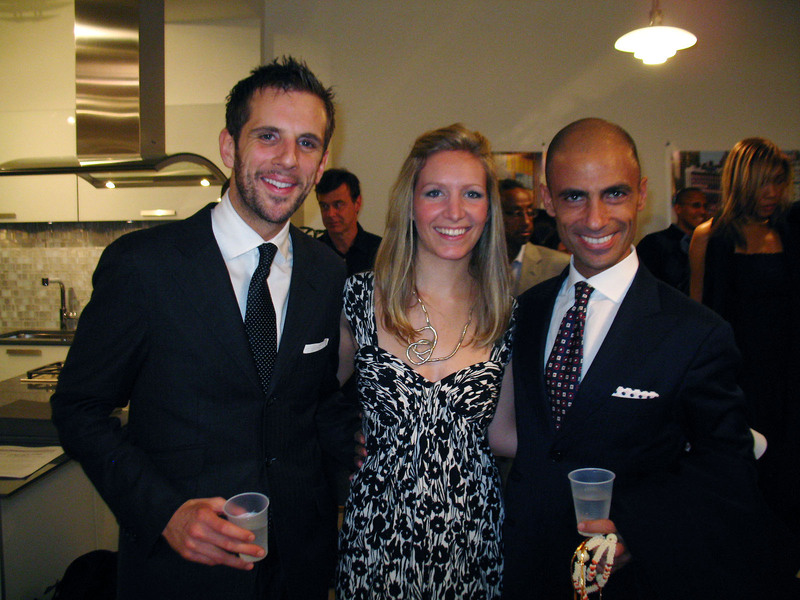 A resounding thank you to Mohammed and Portia at ﻿Kitchen Habitat NYC﻿ for their hospitality and their devotion to showcasing emerging and established artists alike in their fabulous space. This is our third hit show with them!